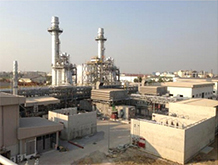 December 15, 2014 - Following a successful bid in international bidding, SHINRYO CORPORATION (“SHINRYO”) has received the order to build Phase 2 of the Bangpa-in Cogeneration Plant in Thailand. The Bangpa-in Cogeneration Plant is being built at Bangpa-in Industrial Estate in Ayutthaya Province, roughly 50km north of the Thai capital of Bangkok. The client in this project is Bangpa-in Cogeneration Limited※1, and the company contracted to manage the construction work is Bangpa-in Cogeneration's parent company, Ch. Karnchang Public Company Limited. Phase 1 of the project was contracted to SHINRYO, which completed construction in June 2013. We believe the award of Phase 2 to SHINRYO testifies to the high regard in which our track record in Phase 1 is held. Phase 2 adopts a natural-gas combined-cycle power-generating system, consisting of two gas turbines, two heat recovery steam boiler and one steam turbine. Its power output is 114MW and steam is supplied at a rate of 20t/h (at pressure of 19bar and temperature of 209°C). The project forms part of the “small power producers” (SPP)※2 plan drafted by Thailand’s state power company, the Electricity Generating Authority of Thailand (EGAT). As with Phase 1, the objective of Phase 2 is to supply 90MWh to EGAT’s electricity grid for 25 years. The construction agreement was officially signed on November 20, 2014. Construction will begin in February 2015 and is due for completion in June 2017. The contract was awarded to a consortium of SHINRYO and its Thai subsidiary, Thai Shinryo Limited (“the Consortium”), on a full turnkey basis. The Consortium is responsible for all aspects of the construction project from design through procurement of equipment and materials to construction and test operation. The Consortium has built four cogeneration plants in Thailand, including its debut project, a plant supplying energy to Suvarnabhumi International Airport, and Bangpa-in Phase 1. 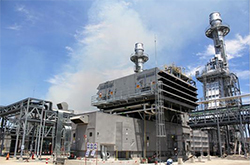 Bangpa-in Phase 2 marks the fifth cogeneration project awarded to the Consortium in Thailand. ※1Bangpa-in Cogeneration Limited is a subsidiary of CK Power Public Company Limited, a power-generation holding company owned by Ch. Karnchang Public Company Limited. ※2The Small Power Producers (SPP) program is a program launched by the Thai government in 1992 with two objectives: 1) to increase the efficiency of energy use by incentivizing small-scale operators and utilizing by-products and recovered energy from existing energy sources, and 2) to reduce the import and consumption of petroleum. Bidding Process and Program Operation : The bidding process for SPP projects differs from competitive tender. Operators submit project proposals in response to a request for bids from EGAT. Projects that satisfy certain standards are approved to go ahead as SPP projects. Electricity fees and other conditions of electricity sale are specified by EGAT at the time of the request for proposals and are applied to the winning operator. When the SPP program is applied to an SPP operator, EGAT guarantees that it will purchase up to 90MW. The operator is free to sell the remaining electrical power and heat (steam, chilled water) independently to businesses in the industrial estate and other customers. December 1, 2014 - Compliance Promotion System was updated. December 1, 2014 - The list of Executive officers was updated. The Corporate Governance Framework was posted on this website. December 1, 2014 - Organization was updated. 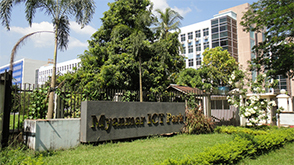 November 28, 2014 - On November 19, SHINRYO CORPORATION ("SHINRYO") opened its sales base in Myanmar, a market that attracts a lot of attention for the reason of accelerated market entries and investments from Japan. The sales base was established as a Myanmar branch of Thai Shinryo Limited, a local subsidiary of SHINRYO in Thailand. While SHINRYO has a track record for engaging in various construction projects in Myanmar such as the Sakura Tower in Yangon, this is the first time for it to place its own sales base in the country. 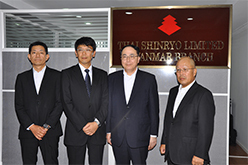 Since full-fledged participation in an overseas construction project in 1972, SHINRYO has steadily expanded its overseas operation by opening many branches and local subsidiaries, and currently has around 2,000 local employees mainly in Southeast Asia countries: the number of local employees is much more than that of Japanese employees dispatched there. SHINRYO has built a solid track record for overseas construction works ranging from general ventilating and air conditioning works to construction of transportation and energy infrastructures such subways, airports and district cooling systems. Leveraging SHINRYO's proven track record for overseas construction projects, the branch of Thai Shinryo Limited opens an office in Yangon, the largest city in Myanmar, and will engage in sales activities to win package contracts covering air-conditioning work, plumbing work, electrical work and plant construction, as well as traffic and energy infrastructure projects. SHINRYO will expand the sales activities through the branch further in accordance with the future trends of the Asian frontier markets. 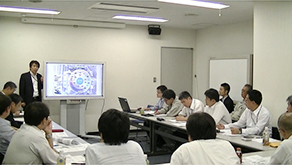 Nov 28, 2014Start of the Program to Foster the "BIM Managers"
November 28, 2014 - SHINRYO CORPORATION ("SHINRYO") has started the program to foster the "BIM Managers" who will lead operation of BIM*1 and will manage and coordinate BIM operation at site in an appropriate manner. Defining the main features of "SHIRYO's BIM" as capabilities to (1) utilize ICT including 3D-CAD throughout life cycle management of the buildings, (2) pursue "enhancement of productivity," "high quality" and "reduction of burden on the environment," (3) establish win-win relationship with clients and the members in the supply chain and (4) respond to ever-changing market needs, the company positions the BIM Managers as "those who operate and manage BIM in construction projects." 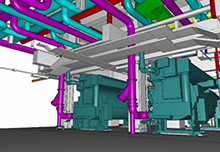 When BIM was introduced, SHINRYO focused on BIM operation combined with "S-CAD," its 3D-CAD, and established the Technical Supervision Division BIM Center for that purpose. Since then, 10 years have passed, and expecting that demand for operation and management of BIM would further increase, the company has decided to foster the "BIM Managers" to enhance customer satisfaction relating to BIM. By sharing the accumulated best practices in the "BIM Manager Program" provided by the BIM Center, SHINRYO will foster the "BIM Managers" with the insight into the BIM management approach specified by SHINRYO, for expansion of its customer base. Now, SHINRYO invites participants in the program across the company from various sections including engineering, design and sales divisions without setting any condition, and plans to provide beginner, intermediate and advanced courses based on participant's desire. 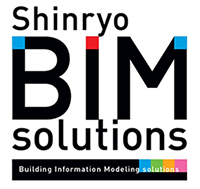 In the near future, SHINRYO will positively promote BIM for construction projects by utilizing its BIM Managers. Through "visualization" of processes, the company plans to share information with clients and concerned parties of projects, in order to facilitate meetings and coordination more smoothly and more quickly. November 28, 2014 - SHINRYO CORPORATION ("SHINRYO") has introduced the Space Scanning System, the first of its BIM Solution Series, to the market. 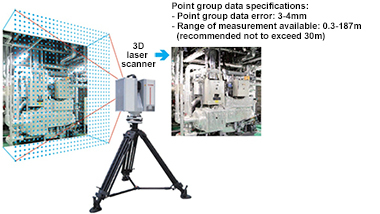 Space Scanning System is a BIM tool that uses the Company's original CAD software "S-CAD" to directly read the point group data captured by a three-dimensional laser scanner, create precise three-dimensional models capturing the space of the facility surveyed, and then enable further use of the models for renovations and other purposes. The system has already been tried with as many as thirty facilities and has proven itself as a speedy and smart solution from the capture of facilities' space to the actual plan of renovation projects. Because of the high praise that the system earned from the clients, SHINRYO has decided to add the system officially to its product line-up for introduction to the market. In addition, SHINRYO positions the Space Scanning System as the first product of the BIM Solution Series, intending to expand its BIM tools series in the future. Currently we are preparing the BIM Solution Series 2-4 and will announce the products as soon as they are ready for commercialization. With this series, we hope to expand our BIM Solution Service to the greater satisfaction of our clients. November 18, 2014 - SHINRYO CORPORATION announced the following organizational change (effective Dec 1). Compliance Promotion Division will be created. 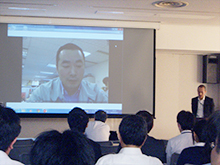 October 24, 2014 - SHINRYO CORPORATION ("SHINRYO") held the First General Forum "Overseas Special Edition", titled "SHINRYO Forum" on October 17, 2014. The Company has addressed its key policy for the next three-year plan of "expanding business overseas", thus it is pursuing expansion in other business fields and local businesses, reinforcement of personnel, further globalization of its domestic business, etc. 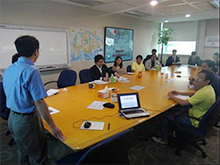 As part of such plan, by organizing this time the "Overseas Special Edition", SHINRYO created the opportunity of having its young employees, active on the global frontlines in sales and technical development, passionately sharing with their colleagues the fulfillment, pride, but also hardships of working abroad, and thus enhancing its employees' understanding and enthusiasm over conducting business overseas. Presenters gathered from local entities in each country of our global network, such as "SHINRYO Philippines", "SHINRYO Vietnam", "SHINRYO Malaysia", "SHINRYO Singapore", etc. Their presentations included personal experience in actual construction projects. The meeting was held at the Company, with the participation of 256 representatives from 10 divisions and branch offices all over the country, linked to by video conference. Following each presentation, there was a lively exchange of ideas and opinions, with the whole venue buzzing with the excitement of both presenters and participants. October 14, 2014 - Air Conditioning Equipment Division has been relocated. October 1, 2014 - Corporate information was updated. October 1, 2014 - Organization and Network were updated. Sept. 18, 2014 - SHINRYO CORPORATION ("SHINRYO") is pleased to announce the release of the "Formaldehyde Removal System" on September 10 2014. We introduce below excerpts of the press release data. 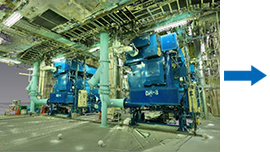 SHINRYO CORPORATION ("SHINRYO") has developed 2 types of unique technology: U Flow System, an airflow system which suppresses dispersion, and MediECO-FA, a formaldehyde removal machine. In addition to improving the working environment, this technology fulfills a broad range of needs including improved operability, energy saving, and reduction of environmental load. In the pathology laboratories and autopsy rooms of hospitals and pharmaceutical research institutes, the carcinogen formaldehyde is released into the room during cutting and procedures such as using formalin for tissue fixation of organs, washing organs with water, and taking photographs for records. Such procedures are frequently performed for long periods of time, creating a high risk that workers will inhale formaldehyde which is emitted during the procedures. In regards to such conditions, the Ordinance on Prevention of Hazards Due to Specified Chemical Substances was revised in 2008, with control parameters for formaldehyde being set at 0.1 ppm or lower. Currently, the improvement of the working environment is a task of urgent importance. 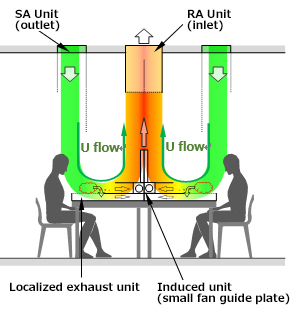 U Flow System is a localized exhaust system which utilizes a U-shaped airflow. It is intended for use with work platforms. High concentration air stagnating in the vicinity of the formaldehyde emission source is discharged by the localized exhaust system over the work platform. Furthermore, low concentration area which is within control parameters and stagnates under the work platform is discharged by the U-shaped airflow. These two measures suppress the dispersion of formaldehyde while realizing a safe working environment and easy operability. U Flow System is highly acclaimed for its operability. A total of 20 units have been installed as of July 2014. A working environment within control parameters has been realized at all installation locations. MediECO-FA is a wet removal machine composed of a chemical solution supply unit and a formaldehyde removal unit. Safe chemical solutions using food additives are dripped into the Washer media (a polyethylene terephthalate filter that heightens the contact efficiency of the passing airflow and chemicals) inside the formaldehyde removal unit. When the air containing formaldehyde passes through the Washer media, the formaldehyde is removed by the adsorption reaction of the chemical solution and formaldehyde. The most distinctive feature of MediECO-FA is the formaldehyde removal performance. When formaldehyde concentration at the inlet is 0.1 ppm, a removal efficiency of 90% or higher is maintained from 370 to 1,100 hours (approx. 2 to 6 months when assuming an 8-hour work day and 22 work days per month) depending on the capacity of the chemical solution tank. Compared to conventional removal technology, MediECO-FA maintains a high removal rate for a long period of time. This reduces maintenance costs and realizes a safe working environment. It also enables construction of circulatory removal (refer to Chapter 4 for details) ventilation systems which were previously difficult to implement. We offer 3 types of MediECO-FA according to air throughput (3,000m3/h type, 6,000m3/h type, 12,000m3/h type). The machine has received high acclaim for its removal performance and energy saving properties. A total of 6 units have been installed as of July 2014. A removal rate of 90% or higher has been realized at all installation locations. In addition to product sales, SHINRYO utilizes our experience gained as a total environmental engineering company to provide added-value ventilation systems with benefits such as enhanced energy savings. 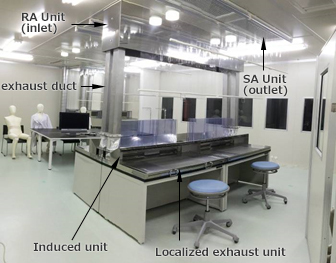 Furthermore, by utilizing our CFD (Computational Fluid Dynamics) analysis developed through more than 20 years of research and development, we offer planning for ventilation systems which consider air current and other comfort factors in addition to formaldehyde concentration. MARUNOUCHI Branch will be created. HOKKAIDO Branch will be created. The following personnel will retire or transfer to new duties, upon expiration of their terms of office (effective September 30). Managing Executive Officer SHOHEI TAKAOKA He will be appointed as Adviser of Shinryo Kougyo as of October 1, 2014. Executive Officer KOUJI MIHARA He will be appointed as General Manager of CHUGOKU Branch Marketing Department as of October 1, 2014. August 29, 2014 - SHINRYO CORPORATION ("SHINRYO") held its "Doctor Air: Children visiting day 2014!" 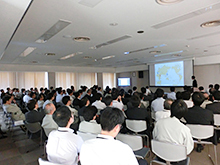 event in the Research and Development Center (Tsukuba) on August 1. On the day, 83 children, mostly elementary and junior high school students, and their parents, the Company's employees, gathered from every corner of the country with the total number of visitors reaching as many as 150. The aim was to teach the participants about various issues involving air, nurturing, so to speak, "doctors of the air science". During the event, we conveyed the Company's know-how to the participants in an easy-to-understand way, making sure it can be later put by the children to good use in their independent research projects they need to do for schools. We conducted four experiments/hands-on experiences, that is, (1) Creating cold water and air, (2) Removing smells, (3) Seeing the airflow, and (4) Learning how sounds are heard. On the day, the Company's Vice President also attended the event, handing out the "Doctor Air: Children visiting day " certificates to each of the participants at the end of the proceedings. The children visiting day events have been held from 2011 every year to give an opportunity for the children of the Company's employees to learn more about their fathers' and mothers' work, and, by forging a deeper understanding of the jobs among the family members, making our employees feel pride in what they do. The initiative of children visiting days is a great way to create fond memories of summer vacation for the employees, their spouses and their children, and the Company shall continue holding these events annually as a part of its CSR activities. In order to make a room cool, it is necessary to make some cool air. In the experiment, the participants cool the water down using an ice thermal storage demo machine, then cool the air down using this water, and have the mechanism explained to them. In order to create a comfortable environment, it is also important to remove disagreeable smells. In the experiment, the participants use activated carbon to remove smells of curry powder, cinnamon, powdered wasabi, and softening agents, and have the mechanism explained to them. In order to create a comfortable environment, it is necessary to control the flow of air. Using air guns and smoke, the participants experience airflow and have its importance explained to them. In order to create a comfortable environment, it is necessary to make undesired sounds as small as possible. The participants play musical instruments in an anechoic room and a reverberation room, and after experiencing the difference of how sounds are heard in each environment, study about the mechanism of each room. 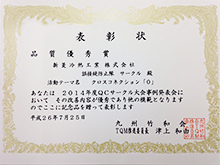 August 27, 2014 - SHINRYO CORPORATION ("SHINRYO") placed 3rd within the Kyushu region and received the Outstanding Quality Award at the QC Circle Presentation held by Takenaka Corporation. 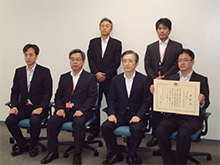 This award was in recognition of the quality control SHINRYO provided in the construction of the Daini Hakata Kaisei Building by aiming for zero cross connections as a member of the QC circle for preventing misconnections, and the achievement of such goal. 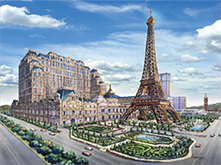 August 1, 2014 - SHINRYO CORPORATION ("SHINRYO") Macau Branch Office was awarded the contract of MVAC System at Podium area includes restaurants, lounges, retail shops, entertainment and recreation areas for The Parisian Macao. The contract amount of the works is around 6,600,000,000 by Japanese Yen. This facility is now under construction by Venetian Cotai Limited, affiliated company of Las Vegas Sands Corp. ("LVSC") which is the world's leading developer and operator of integrated resorts. The floor area of this Podium area is approximately 200,000 square meters, and nearly equal to the floor area of Tokyo Metropolitan Government Main Building No. 1. LVSC has been continuously developing integrated resorts in Macao, and SHINRYO has been awarded several contracts from LVSC's affiliated company, by the reason of the job experience and the achievement made for HVAC and Energy Plant System in overseas countries, as well as in Japan. SHINRYO worked for Podium HVAC System and Energy Plant System for both The Venetian Macao opened in 2007 ( this integrated resort has the world's largest casino space of around 51,000 square meters, around 150,000 square meters retail areas, convention space, indoor arena, hotel and etc. ) and Sands Cotai Central opened in 2012. And this contract for The Parisian Macao Podium HVAC is the 5th contract for SHINRYO in Macao. As mentioned above, SHINRYO has been awarded the contract from the affiliated company of LVSC since year 2005 in Macao for the construction of integrated resorts. And based on the experience and achievement made in the integrated resort in Macao, SHINRYO is also working for HVAC and Energy Plant System at the integrated resort facility including casino, in the several countries in Southeast Asia including Singapore. 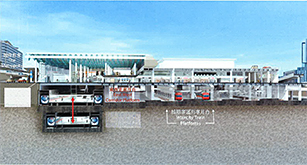 July 17, 2014 - SHINRYO CORPORATION ("SHINRYO") Hong Kong Branch Office, was awarded the contract by MTR Corporation Limited ("MTR Corporation"), for the construction and modification of Building Services in main interchange station and stabling sidings of the new railway project in Hong Kong. SHINRYO has received numerous orders from MTR Corporation for the past 37 years. 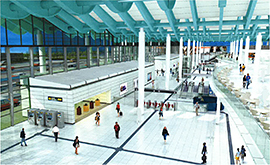 SHINRYO will complete the construction and modification of Building Services by 2018 at Hung Hom Station and Hung Hom Stabling Sidings of the Shatin to Central Link, in order to improve the friendliness and comfortableness of increased users in the station after the opening of this new railway line. The scope of works in this project includes not only environmental control system, electrical system, fire protection system, plumbing and drainage system, but also station and depot management system. Up to this moment, SHINRYO has completed the works in Hong Kong at stations, road and train tunnels, ferry terminal between HK and China, and now working for the construction of new railway line including environmental control system and electrical system at West Kowloon Terminus. SHINRYO is continuously making a contribution to the construction and improvement of the infrastructure facilities in Hong Kong. SHINRYO started the business at overseas from 1972, established Hong Kong Branch Office at 1978 and has expanded the business at most of the countries in Southeast Asia. SHINRYO employed over 500 staffs at Hong Kong by Branch Office and two subsidiary companies, consists of over 500 local people and only 10 Japanese. SHINRYO is also trying the best to increase the local employment and introduce the latest building service technology from Japan. 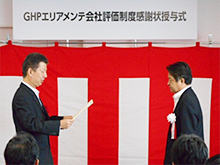 July 8, 2014 - SHINRYO CORPORATION ("SHINRYO") has received an order from Keppel DHCS Pte. Ltd. ("Keppel"), a public corporation of Singapore, for a district cooling system ("DCS") project at Mediapolis, an industrial estate planned for construction in central Singapore. The Mediapolis complex is expected to serve as a Singapore's communications, information and media hub. The DCS project for which SHINRYO will be responsible includes both the heat-source plant supplying the chilled water and the facilities for installation to the offices of companies participating in Mediapolis. Mediapolis is slated to commence operations in May 2015. The anchor tenant at Mediapolis will be Mediacorp Pte Ltd., the national broadcasting service of Singapore. Because they will serve as a broadcasting station, Mediacorp requires the most stringent noise and vibration standards at its Mediapolis facilities. SHINRYO was selected for the project for of its ample capability to meet these needs, backed by a wealth of expertise in solutions against noise and vibration. 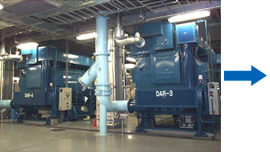 SHINRYO's track record District Heating and Cooling ("DHC") operations is unsurpassed. In Japan, the Company boasts top market share in this field, winning orders for Senri New Town, the first DHC system in Japan; the Shinjuku-fukutoshin District, Japan's largest DHC project; and Yokohama Minato Mirai 21, a project on an impressive scale. Overseas, the Company has completed an impressive portfolio of DCS projects. In Abu Dhabi, United Arab Emirates, SHINRYO has won the order for the DCS project at Abu Dhabi International Airport, an undertaking commensurate in scale with Shinjuku-fukutoshin. In Singapore, under a Singapore government policy of promoting high-efficiency energy use, SHINRYO is winning order after order, including for Biopolis, a complex adjacent to Mediapolis; and Changi Business Park. As the above achievements testify, SHINRYO earned top marks in Keppel's evaluation based on unrivaled technology amassed in DHC, as well as a tremendous portfolio of projects completed and ordered throughout Japan and around the world. July 4, 2014 - SHINRYO CORPORATION ("SHINRYO")'s order book for overseas projects is growing rapidly. In response to this growing demand, the Company has already launched technical seminars abroad, assigning researchers from SHINRYO's Central Laboratory to serve as instructors in each location. (See "On-site Engineering Guidance at Overseas Bases Shifts into High Gear," SHINRYO News, June 30, 2014.) Today SHINRYO has announced that all employees will participate in training overseas as part of their new-employee training regimen. The directive applies to all new employees inducted in or after April 2014. Until the new directive, engineering employees underwent seven months of training at project sites in Tokyo Metropolitan area, while administrative employees accepted five months of on-site training. Under the newly introduced "short-term overseas trainee system for new employees," an overseas training stint of about one week is added. SHINRYO's overseas expansion began in 1972, as mounting orders for overseas projects drove the Company's full-fledged entry into the international market. Beginning in Southeast Asia, the Company established numerous branch offices and local affiliates as it steadily expanded overseas operations. Today the number of overseas SHINRYO employees stands at 1,800, easily surpassing the number of Japanese staff seconded overseas. Amid a constantly shifting operating environment, SHINRYO has long believed in the value of developing employees' talents through the experience of working overseas. With this goal in mind, SHINRYO has developed a number of overseas training programs. These include transfer plans for personnel stationed at overseas bases and a system for dispatch of support staff from divisions in Japan to the overseas various projects. The purpose of the new system is to strengthen SHINRYO's ability to respond to overseas project opportunities. By gaining work experience on-site, trainees learn at first hand about conditions at overseas Group locations and gain a deeper understanding about living and working overseas. At the same time, trainees enjoy opportunities to build personal networks with overseas local staff, bringing Japanese and overseas staff together in a more close-knit organization. In this year's short-term overseas trainee system for new employees, 60 new employees will be dispatched to multiple worksites in Singapore, Vietnam and other countries from August to October 2014. 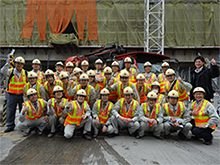 Ahead of the program's official introduction, all new employees inducted in April 2013 (50 individuals) were assigned to one of two groups and sent to observe sites in Hong Kong and the Philippines (see photo). 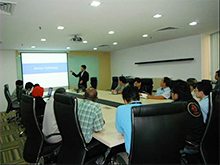 By observing the Group's overseas activities at first hand, the new employees completed their first-year training. The Company plans to roll out other training programs going forward. In addition to the short-term overseas trainee system for new employees, SHINRYO plans to introduce an "overseas practicum system." This program will provide between one and three years of hands-on experience working overseas locations, targeting employees who have been with SHINRYO for four to eight years but do not yet have overseas work experience. 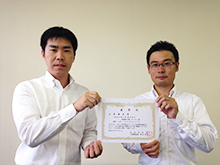 June 30, 2014 - SHINRYO CORPORATION ("SHINRYO") has decided to shift its technology training program into high gear, by dispatching researchers from the Central Laboratory to serve as instructors at overseas Company locations. The aims of this program are several-fold. First, the Company is determined to respond effectively to its growing order book for major overseas projects. Second, SHINRYO seeks to strengthen the ability of its employees, as well as locally hired employees of SHINRYO's overseas affiliates, to put the Company's portfolio of unique technologies to work. Since 1972, when SHINRYO led the industry in advancing into overseas business, the Company has expanded these operations with steady determination, winning orders for numerous large-scale projects. Focusing on Southeast Asia and the Middle East, these projects include comprehensive orders for electrical, HVAC and heat-source installation in subways, airports, plants and other infrastructure. Today the Company employs some 1,800 staff worldwide except Japan, primarily in Southeast Asia. With consultations on large overseas projects expected to multiply steadily, SHINRYO is urgently confronted with the need to reinforce its ability to respond to technological issues and improve its technology for quality control. 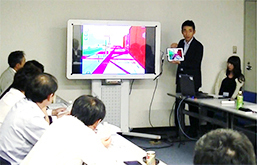 Against this background, in March 2014 SHINRYO began rolling out a series of technology seminars, beginning at PT. SHINRYO INDONESIA and SHINRYO SINGAPORE PTE LTD and continuing in May at Thai Shinryo Limited and SHINRYO (MALAYSIA) SDN. BHD. The seminars provide an overall introduction to the operations of the Central Laboratory as well as the Company's technologies for preventing corrosion, noise and vibration. These technologies to defeat corrosion, noise and vibration are the Central Laboratory's own technologies, developed over many years of steadfast effort. They were selected as the first themes for the technology seminars in response to mounting overseas demand for them in quality-control applications. At the seminars conducted so far, a total of 126 employees participated at four Company locations. Seminars addressed measures against a variety of issues, including corrosion in stainless steel, corrosion from contact between metals of different types, noise propagated through pump-line systems, and noise from packaged outdoor units. In addition to seminars conducted at offices, participants attended visits to local construction sites, where they discussed specific technical problems at each site. Future seminars will be conducted after thorough planning and preparation, to promote the deployment of other core technologies from the Central Laboratory and the application of worksite rationalization technologies developed by the Laboratory. 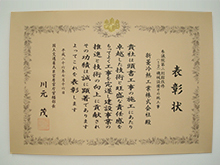 July 29, 2014 - SHINRYO CORPORATION's Tokyo Metropolitan Area Division has won the 2014 Superior Project Award of the Government Buildings Department, Minister's Secretariat, Ministry of Land, Infrastructure, Transport and Tourism (MLIT), for Mechanical work and other facilities projects for the renovation of the House of Councillors No. 2 Annex (12). The Tokyo Metropolitan Area Division won high praise from the Government Buildings Department for its keen attention to detail and creative originality despite a tight schedule and severe restrictions on the renovation project, which enabled smooth implementation and excellent schedule management. 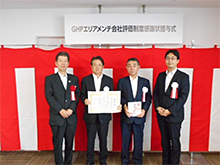 June 19, 2014 - For the second year in a row, SHINRYO CORPORATION has earned the Award for Excellence from Tokyo Gas Co., Ltd.'s Gas Heat Pump (GHP) area maintenance company evaluation system. The GHP area maintenance company evaluation system assesses customer satisfaction by awarding scores for 25 items, including evaluation of response to repair requests and scheduled maintenance and evaluation of organizations and skills with respect to systems. The purpose of the GHP area maintenance company evaluation system is to improve GHP maintenance quality and customer satisfaction, and to improve reliability by reducing GHP accidents. Evaluations are conducted based on total results over the course of each year. May 2, 2014 - SHINRYO CORPORATION announced Mr. TAKAO EGAWA, a Company's Senior Corporate Auditor, passed away on May 1, 2014. For that reason, as of the same day, the retirement procedures for Mr. Egawa have been conducted. SHINRYO CORPORATION would like to thank everyone for the kindness shown to him during his life (effective May 2). Following this personnel change, the number of auditors at SHINRYO CORPORATION has become three (including two outside corporate auditors), but this number is still sufficient according to the related laws and regulations and the SHINRYO CORPORATION 's articles of incorporation. May 1, 2014 - SHINRYO CORPORATION announced the following organizational change (effective May 1). CSR Promotion Division under the direct control of the president was established. April 2, 2014 - SHINRYO CORPORATION announced the following personnel change for executives (effective March 31 and April 1). March 25, 2014 - SHINRYO CORPORATION announced the following organizational reform and personnel change for executive officers (effective April 1). Operational Audit Division will be changed to Audit Division. General Marketing Division will cease to exist and Marketing Supervision Division will be created.